California’s drought is a domestic challenge, to be taken on at the level of each front and back yard throughout the state’s neighborhoods, subdivisions, and cul-de-sacs. LUSH is a charrette project that uses the MAK Center’s Fitzpatrick-Leland House (R.M. Schindler, 1936) to ask leading landscape architects across Los Angeles to consider solutions both radical and practical. Built on spec for real estate developer Clifton Fitzpatrick, the house embodies many of the views that characterize the building of California in the mid-twentieth century. Prior to construction, there were no houses in this area; the land was too steep and dry, and only supported the grazing of goats. It was modern architecture, and the new understanding of modernist living through technology, that made people even consider this land as habitable. It’s a short connection from there to sprawling suburbs where green lawns grow in desert climates. The Fitzpatrick-Leland House itself was initially landscaped with dozens of yards of sod; twenty years later a swimming pool was added that still remains. 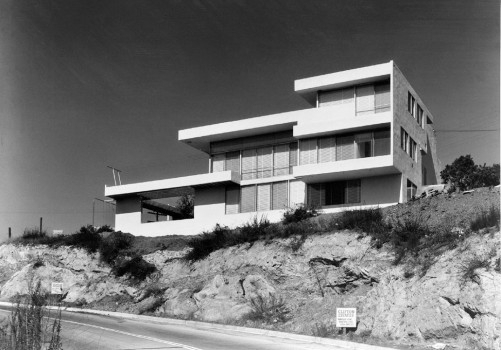 In other words, the house has much in common with the majority of SoCal houses; it therefore offers an opportunity to use the rarified site of a Schindler building to consider issues relevant to the current water crisis, from the Central Coast to Riverside County.